Visual Field analysis is an assessment of the sensitivity of the retina to light, as well as checking for peripheral vision loss. It is often used in cases where there is a suspicion of Glaucoma risk, as well as in cases of acquired brain injury to assess any loss of visual function. Other cases where visual fields are an important test are in stroke patients. The test involves the patient viewing a series of lights in both central and peripheral vision whilst looking into a dome shaped bowl. 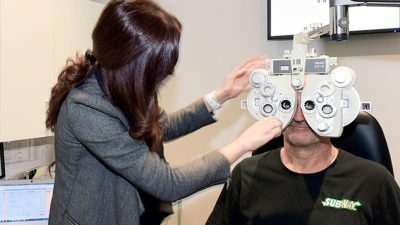 The idea is to assess the sensitivity of all parts of the back of the eye to light, as in many ocular conditions there can be a loss of sensitivity or a complete loss of visual function. Sometimes this is not noticed by the individual if their central vision is intact. A visual field assessment generally takes around twenty minutes and is often repeated periodically for those patients requiring monitoring. A Medicare rebate may be claimed on clinically indicated cases requiring visual field assessment.